In the heart of Tuscany, a land rich of historical and environmental tresures, the sight gets lost on the never-ending rows of hills that sketch the horizon. The many winding roads climb up like tangled grapevine branches, flanked by the knotty trunks of century~old olive trees that symbolise the ancient sacredness of this revered earth. No peak in these places seems to be complete without a castle, a tower or a village. The estate known as «podere la cappella», once called «villaggio di cerbaia», is located a few kilometres from ‘san donato in poggio’, a fascinating well~preserved village, surrounded by marvellous vineyards and orchards. The countryside seems to hold its breath in a sort of magic natural spell that you can feel only in this place. To reach us, from north or south, exit A1 Highway at Firenze Certosa, take Firenze-Siena Highway and exit at San Donato. Turn on the left for San Donato. After about 2 Km, near San Donato village, turn right and then right again for Strada Cerbaia. 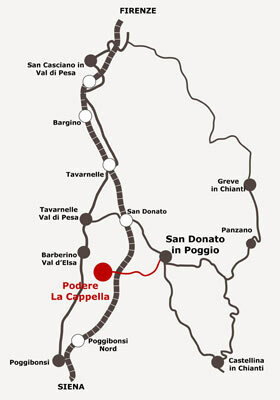 Podere La Cappella stands after 2 km from San Donato.